The Mitutoyo dial indicator has a black or white face, a choice of flat or lug, a 0.375″ stem diameter, and inch measurements. The indicator has a 0.375″ diameter stem, a #4-48 UNF contact point thread mount, and is used to measure surface variations in fractional inches. The choice of black or white dial and a contrasting hand help make measurements easy to read. The dial indicator comes with a choice of flat or lug back for a variety of mounting options. Flat back dial indicators are either clamp-mounted on the stem or plate-mounted on the rear of the indicator. Lug back dial indicators have a protrusion with a hole to mount the indicator using a lug or nut and bolt. Lug back dial test indicators usually come with the lug installed horizontally. The back on most indicators can be rotated to the vertical position. It has a stem design that provides a long clamping range, no through screw-holes on the frame for dust- and water resistance, and an involute curved lifting lever that provides smooth movement of spindle and dovetail joint for a tool-less connection. 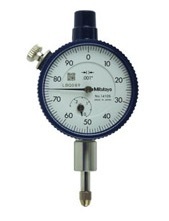 This dial indicator meets ANSI standards, Japanese Industrial Standard (JIS) B7503-1997, and American Gage Design (AGD) standards for face and thread size, and bezel and stem diameter.